Addthis is a good solution for sharing social icons. It tracks the number of shares and it comes with a free version. In the solution below I opted to go with a manual implementation as opposed to using the WordPress plugin. This will help your site speed and is generally good to avoid plugins as much as possible. For using the custom AddThis code you will need to create an account and generate your code from there. Here’s the final custom button widget sample. 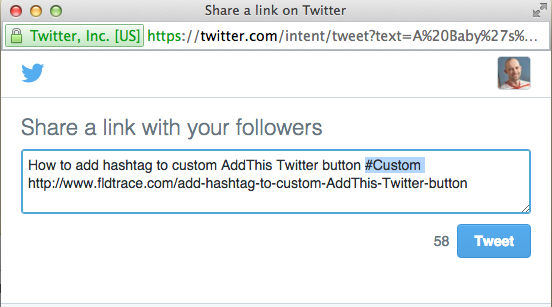 Here’s the code responsible for the the #Custom hashtag on a Addthis button. Go to www.addthis.com/dashboard to customize your tools and don’t forget to add your custom image in the images folder in your theme.